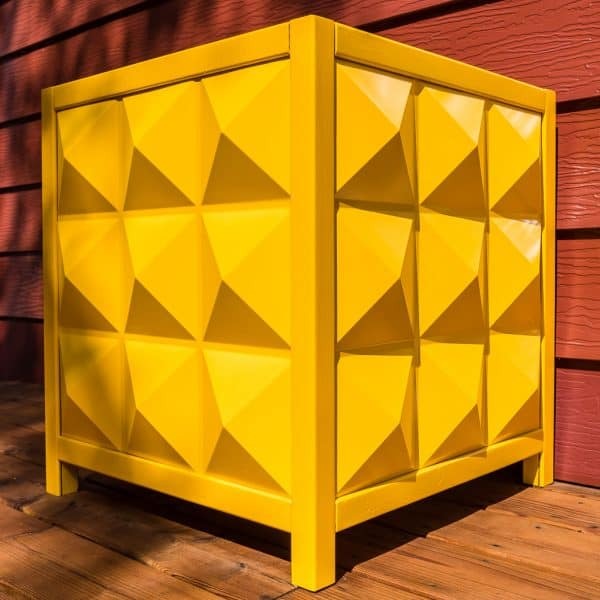 Add a cool geometric statement for your porch with this modern outdoor planter! 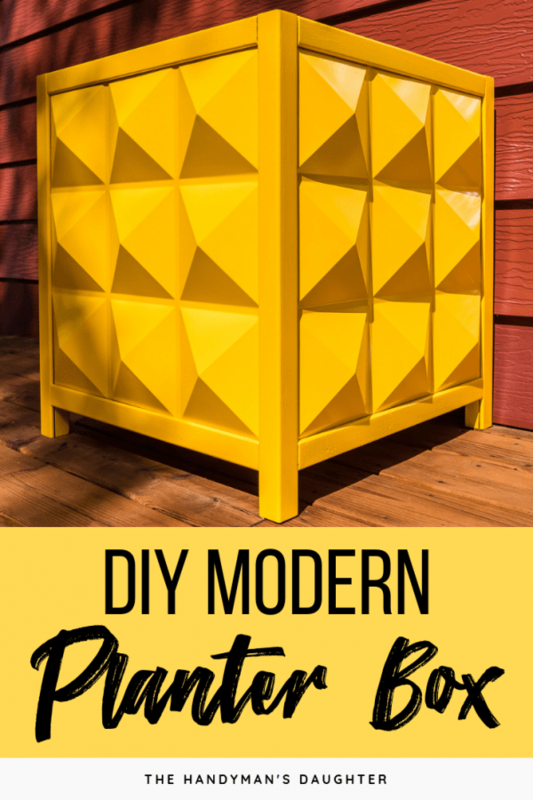 Build the frame, then add PVC panels and a fun color to brighten up your entryway. This month marks the beginning of a new series here at The Handyman’s Daughter. 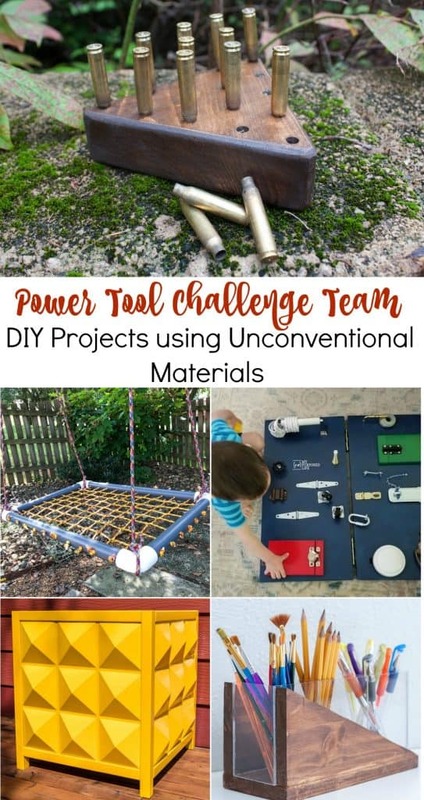 I’ve joined a group of fabulous DIY bloggers for a monthly Power Tool Challenge! This month, we had to build something with unconventional materials. 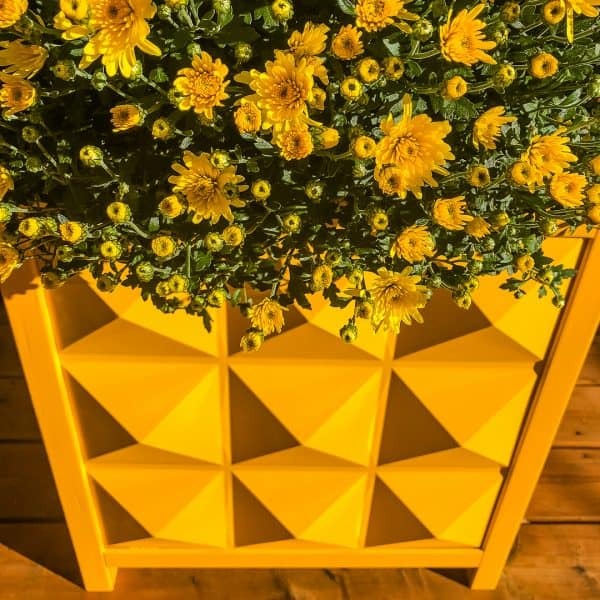 I used these cool three-dimensional PVC wall panels to create a modern outdoor planter! 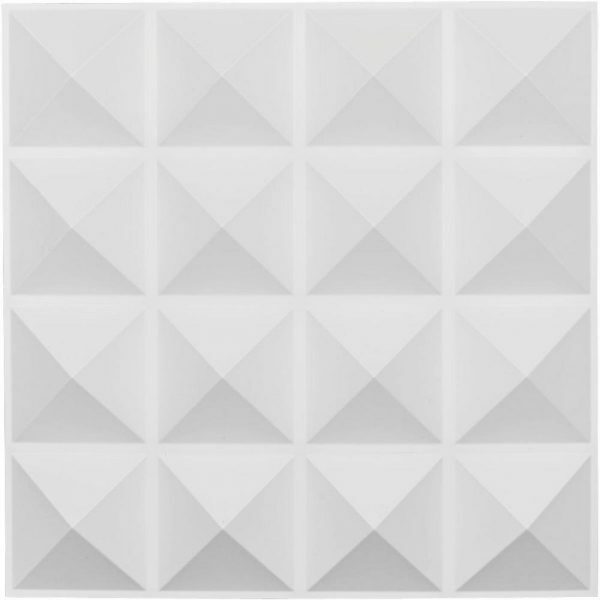 I was browsing the Home Depot website for ideas when I came across these PVC wall panels. There are tons of fun patterns and textures to choose from! 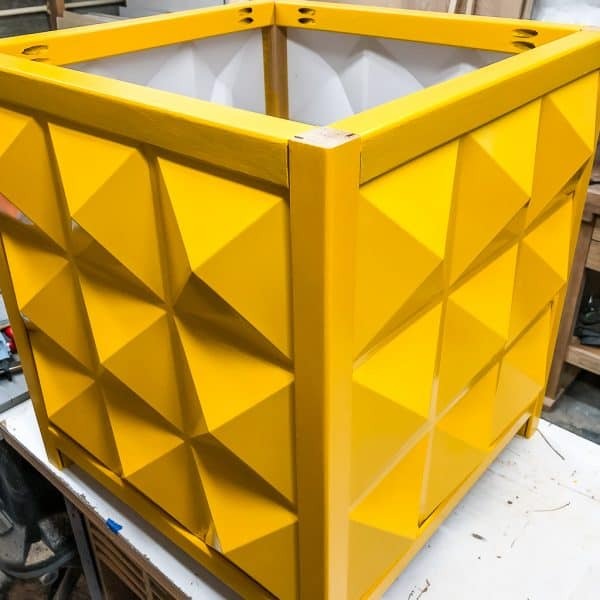 The paintable, waterproof surface is perfect for this modern outdoor planter box! I decided on this cool pyramid shaped design. I used 2 x 2 cedar balusters that I had on hand. 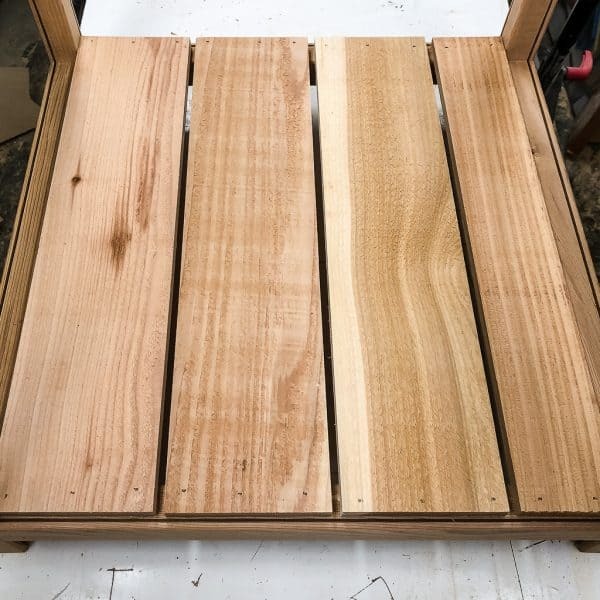 Cedar is rot resistant, so it’s perfect for a planter that will left out in the elements. You could use regular pine boards if the planter is going to be under cover. 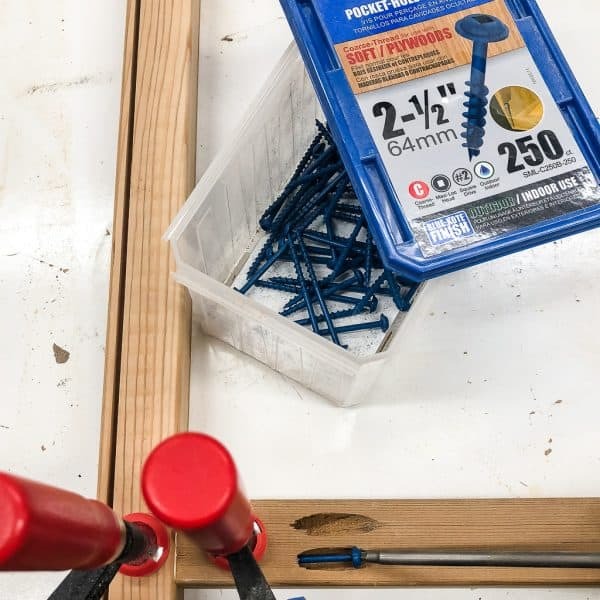 Blu-coat screws are preferred for outdoor use, but you can probably get away with regular ones if you have them on hand. 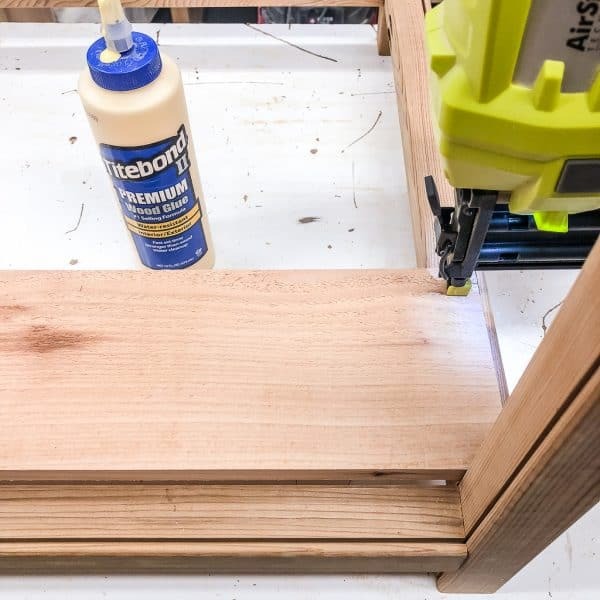 Check out my post comparing the two most popular Kreg Jig models to help you decide which one is right for you. You could also use 1 1/4″ screws, but make sure to predrill your holes! 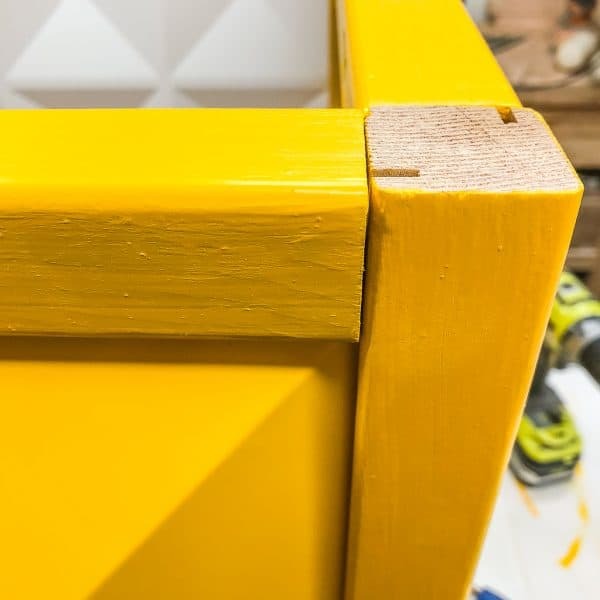 I used Rust-oleum Golden Sunset spray paint, then color matched it to exterior paint for the frame. Don’t forget your safety gear when woodworking! Here are my recommendations for safety glasses and hearing protection. No excuses! Cut the 2 x 2’s so you have four 24″ pieces and eight 19″ pieces. Set the table saw blade depth to 3/8″ and cut a groove into one side of each piece 1/4″ away from the edge. On the longer pieces, cut an additional groove on the adjacent side, but at the opposite corner. Drill pocket holes into both ends of each 19″ piece. These should be placed on the side adjacent to the groove like you see below. Sand all the pieces smooth. I used a random orbit sander for the flat parts, and these contour sanding grips for the rounded corners. The 3/8″ size wraps around the corners of these 2 x 2’s perfectly, so it keeps the curve consistent. Mark a line 2 1/8″ up from the bottom of the 24″ pieces on the two sides with grooves. 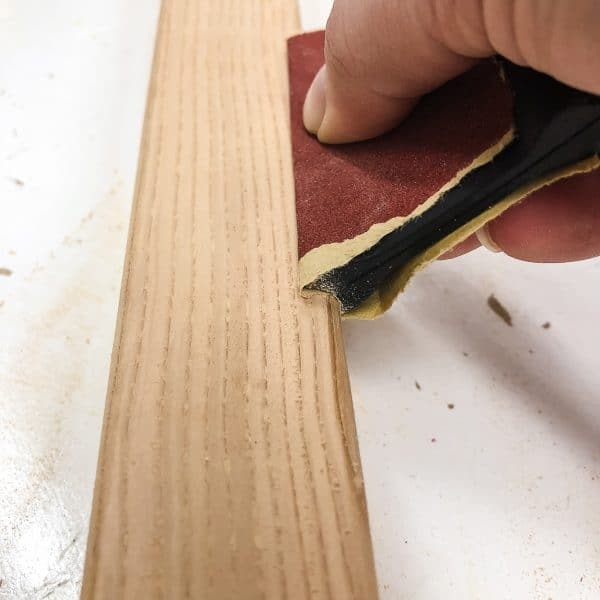 Apply wood glue to the end of a 19″ piece, then align the bottom edge with that mark. 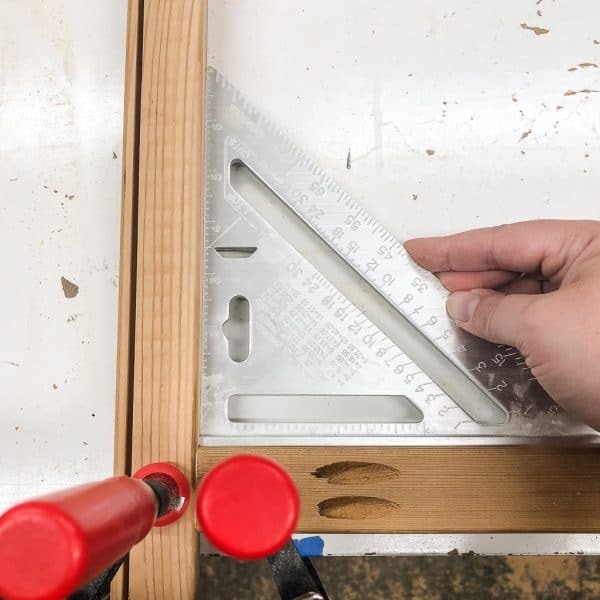 Use a square to make sure it’s at a right angle, then clamp the pieces down to the workbench. Attach the two pieces together with 2 1/2″ pocket hole screws. Sometimes the grooves didn’t quite line up, so I placed a shim under the lower piece before clamping to bring it up to the right height. Repeat with the other set of pocket holes. Then do the same thing with the other two legs. Connect both sets of legs together with the 19″ pieces, keeping the grooves facing up and towards the outside of the frame. 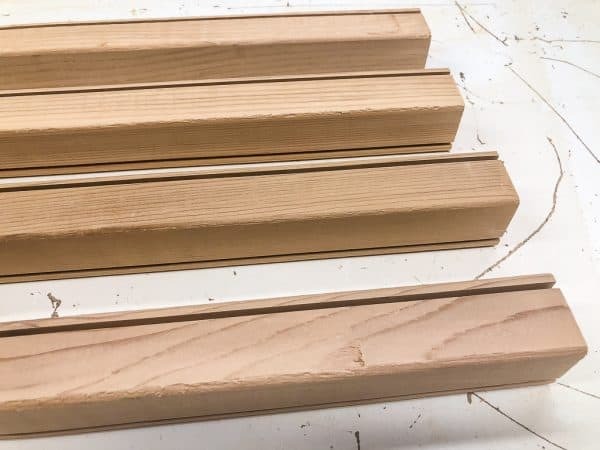 Cut the 5 1/2″ wide cedar fence picket into 21″ long pieces. 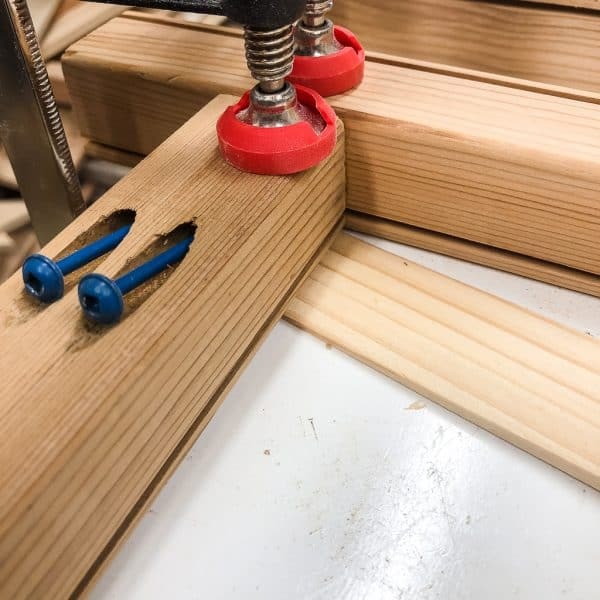 Attach them to the bottom of the frame with wood glue and 1 1/4″ brad nails or screws. 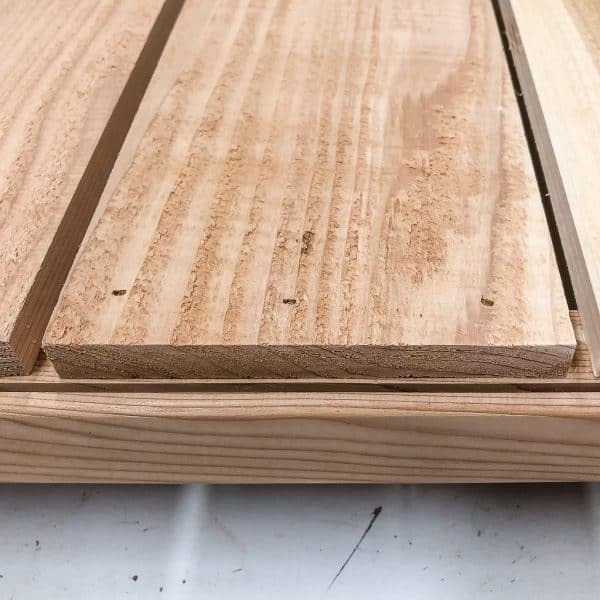 Make sure that the ends of the boards don’t cover up the grooves in the frame. Leave a bit of space between each slat to allow water to drip through. I had to rip one of the slats a little smaller in order for it to fit. We’re not quite done building the frame, but now is a good time to paint. 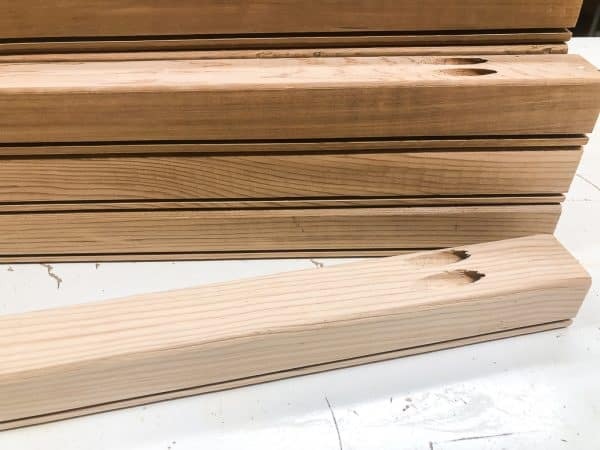 Doing it now will ensure that all the grooves have good coverage without worrying about messing up the PVC panels inside. 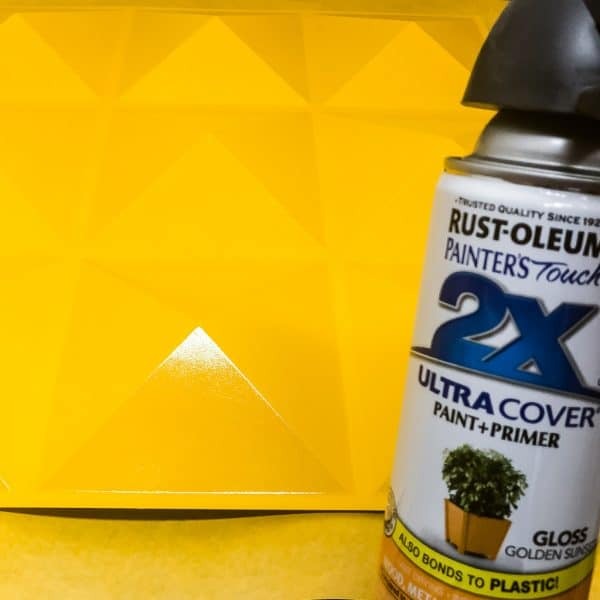 I painted the PVC panels with Rust-oleum Golden Sunset spray paint. 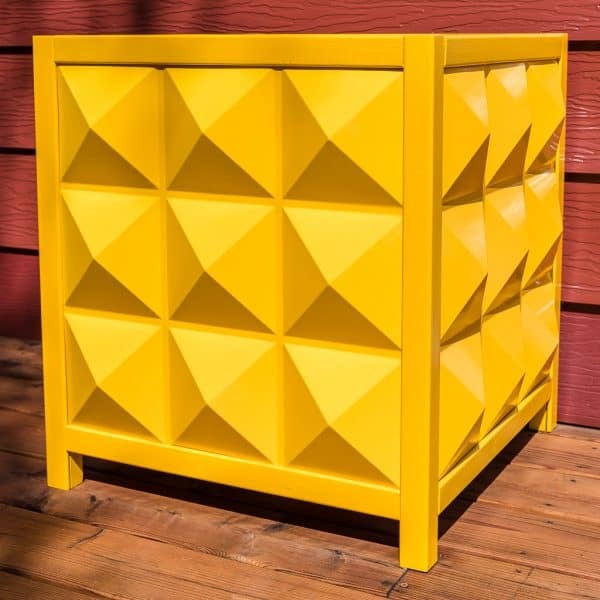 This is the same color as the plastic planter I painted for our front porch this spring, and I love how the bright yellow contrasts with our red siding. This is my spray painting set up when the weather isn’t cooperating outside. 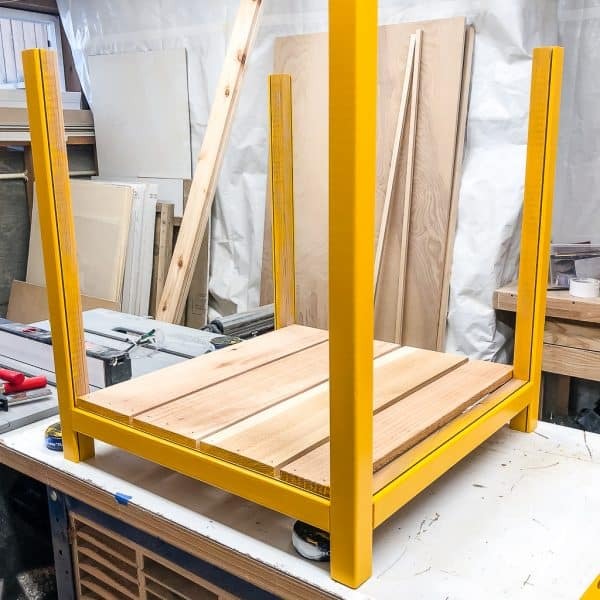 The small HomeRight spray shelter fits on my workbench easily, and protects the rest of the workshop from overspray. A lazy susan with a non-slip lip is under the panel so I can turn it without touching the paint. Just make sure you leave the windows open for ventilation! 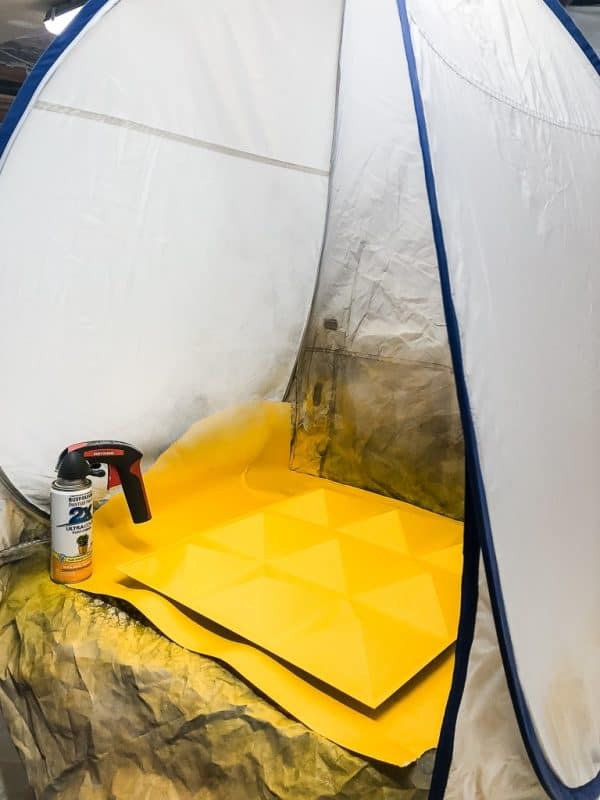 I brought the paper covered in overspray to Home Depot to have them color match the yellow to an exterior paint. I didn’t want to spray paint the entire frame, and I only needed a small sample size to coat the entire exterior. Don’t forget to paint the top pieces too! Here’s the fun part! Insert the edges of the PVC panels into the top of the grooves in the frame, then slide it into place. Fits like a glove! The panels are flexible, so if it’s not resting inside the groove at the bottom, you can bend it a bit until it pops into place. It’s so satisfying when the project in your head starts to turn out exactly like you imagined it! 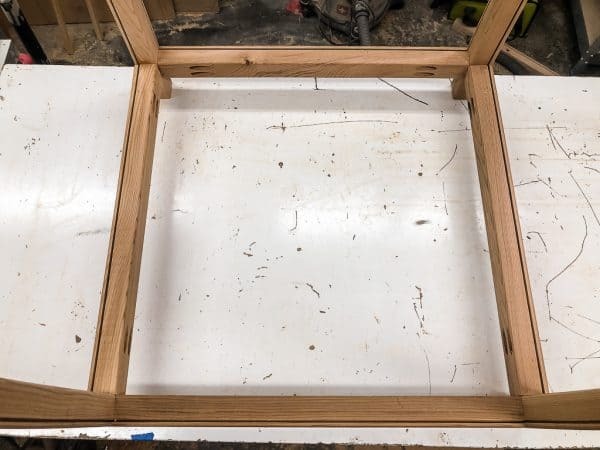 To finish off the modern outdoor planter box, attach the remaining frame pieces to the top. They should be flush with the top of the legs, with the edge of the panel in the groove. I forgot to paint the tops of the legs! Screw the top of the frame together with 2 1/2″ pocket hole screws. 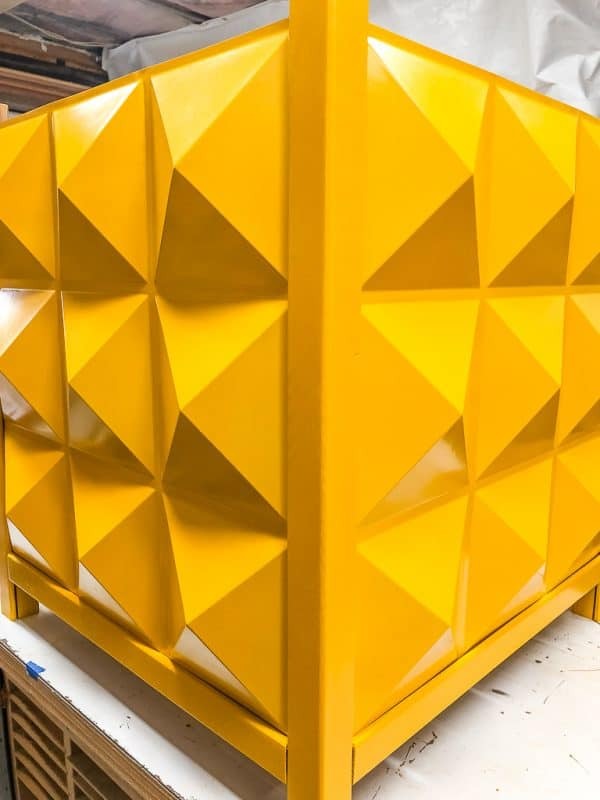 Wow, this planter box makes quite a statement! 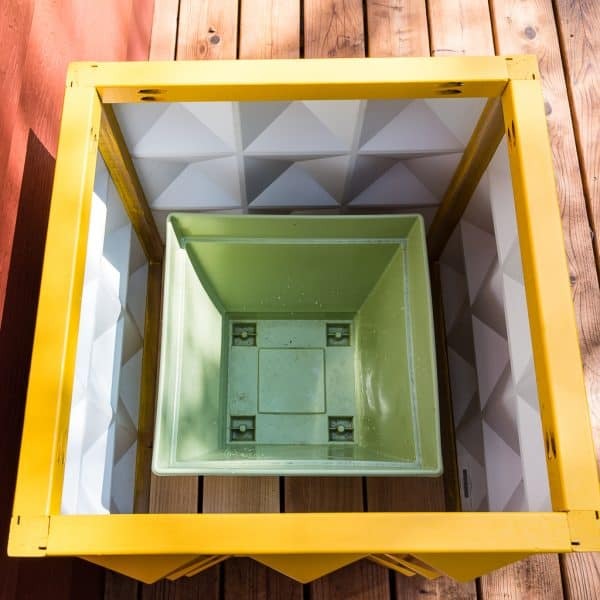 This square plastic planter inside will make it easier to switch out plants, or elevate larger pots. I filled the planter with beautiful fall mums for now, but I’m thinking of a topiary or other interesting plants in the future. I’m thinking of making another version that will convert this planter design into an outdoor side table. You could change the entire look just by switching out the panels! Check out all the other unconventional materials ideas from this month’s challenge! What a creative project! 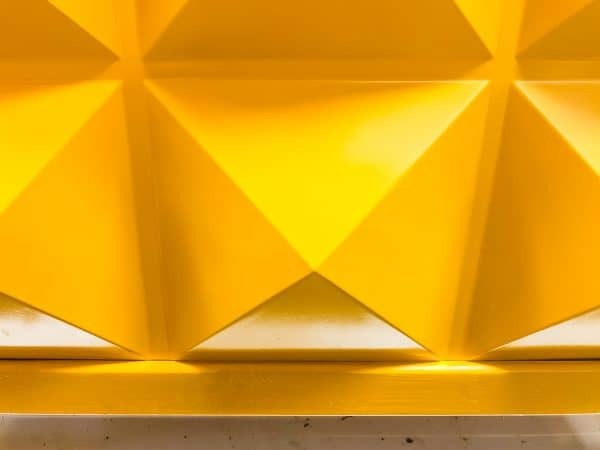 I love the pattern on the PVC panels that you used and also the fun yellow color. I can see these filled with mums or pansies for fall. Glad you’ve joined the Power Tool Challenge! What an awesome idea! I would have never thought to use these panels like this. Honestly I didn’t even know they existed! I need two of these planters. What a cool idea! Those PVC panels are absolutely perfect and the planter turned out so amazing! This is so cool! I’m loving the use of pvc. Our weather here in FL is harsh on wood, even treated wood. I’m pinning to make next year when I can build again! Super tutorial too!! LOVE this idea! And yellow is my favorite color! What a great job! Thanks for sharing with SYC. This planter box turned out sooo cute! Thank you for the idea!